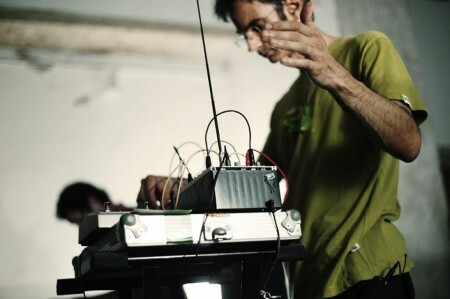 Portuguese artist Rafael Toral plays electronic music as a jazz musician would play his instrument, applying jazz discipline and working practices to his abstract electronics. The result is truly evolutionary music, once described as “a brand of electronic music far more visceral and emotive than that of his cerebral peers.” Melodic without notes, rhythmic without a beat, familiar but strange, meticulous but radically free, it is riddled with interesting paradox, full of clarity and space, articulating silence and sound in a thoughtful, yet physical way. Formerly known for his drone/ambient work with guitar and electronics and acclaimed records such as Wave Field (1994) or Violence of Discovery and Calm of Acceptance (2000), Rafael Toral has radically renewed his approach to music, launching the jazz-inspired and alien-sounding Space Program in 2004, using experimental electronic instruments. Past collaborators include Jim O’Rourke, Evan Parker, John Edwards, Joe Morris, Tatsuya Nakatani, Chris Corsano, Manuel Mota, David Toop, Alvin Lucier, John Zorn, Phill Niblock, Christian Marclay, Sonic Youth, João Paulo Feliciano, Rhys Chatham, Lee Ranaldo, C Spencer Yeh, and Dean Roberts. In 1998 he became a member of MIMEO electronic orchestra, which includes Keith Rowe, Thomas Lehn, Kaffe Matthews, Marcus Schmickler, Jérome Noetinger, Christian Fennesz, Peter Rehberg, Gert-Jan Prins, Cor Fuhler and Phil Durrant. Since 2008 he directs the Space Collective, a slowly developing orchestral group. Seattle-based guitarist Bill Horist delivers an idiosyncratic and richly emotive take on the world’s most ubiquitous instrument. He has played on dozens of records and has performed throughout North and Central America, Europe and Japan; collaborating with numerous leading lights in a beguiling range of genres. Perhaps best known for his prepared guitar treatments, his work is widely regarded alongside masters like Fred Frith and Keith Rowe. He has cultivated a unique voice in a number of styles in the realms of, jazz, rock, folk, and experimental music. Horist is also becoming known as a masterful acoustic fingerstyle player in the tradition of Leo Kottke and John Fahey; additionally incorporating elements from Asia, India, the Middle-East and West Africa.